Toronto – December 13, 2016 – For many of us, December 18 is a day like any other. We will have the privilege of being busying, getting ready for the holidays and contemplating the year ahead. We will be with friends and family, enjoying their company. Children will be laughing and there will be smiles from ear to ear. While we are very fortunate to have this as our reality, others do not share our good fortune. 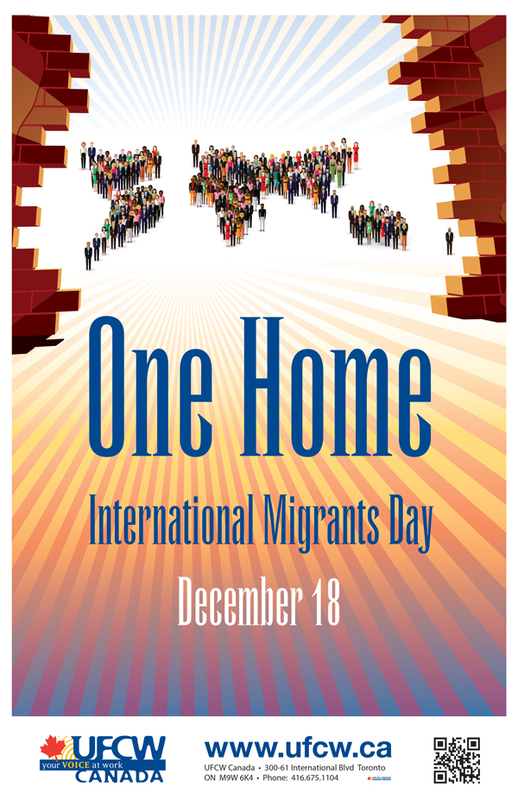 Every year, migrant workers and activists celebrate International Migrants Day on December 18. For tens of millions of people around the world, and hundreds of thousands across Canada, this day is profoundly different than it is for most people. That’s because, for many migrant workers, December 18 is typically spent away from family, toiling for a better future for themselves and the next generation. It is my honour to say that UFCW Canada has been, and continues to be, the leading union in advocating for the rights of migrant workers. We do so in part because we represent thousands of members who arrived in Canada as migrant workers through the Temporary Foreign Worker Program (TFWP). Many of these members are now permanent residents under Provincial Nominee programs as a result of the collective agreements that UFCW Canada has negotiated with several major employers, which proactively advocate for and support the nomination program for UFCW Canada members who arrive as foreign workers. And this past year has marked another big chapter in our advocacy for migrant workers and their rights. With a new government in Ottawa, our union has been encouraging the Liberals to unwind the labyrinth of repressive and unresponsive policies that have harmed so many migrant workers. A key aspect of our 2016 advocacy has been our participation in the Federal Standing Committee on Human Resources, Skills, and Social Development on the beleaguered Temporary Foreign Worker Program. Our submission to the committee, entitled “A New Vision for a Sustainable Immigration System,” calls on the federal government to create a progressive immigration system by providing a path to citizenship for migrant workers and their families. In our opinion, it is essential that migrant workers be able to access permanent immigration status, preferably upon arrival in Canada, in order to reduce the exploitative nature of the TFWP. In addition, UFCW Canada believes that it is integral for all migrant workers to have equal access to Canada Pension Plan (CPP) and Employment Insurance (EI) benefits, particularly because they pay into both programs. Our union also explained to the committee that employer-specific work permits that can tie a worker to an abusive employer should not be allowed under a new and sustainable immigration system. As well, UFCW Canada was clear in our submission to the committee that Canadians want meaningful laws that enable migrant and temporary foreign workers to unionize without fear of reprisal. As we approach a new year, UFCW Canada has a simple request of members, friends, and allies. Remember that the migrant workers who sow and harvest so much of the food that we consume, and who take care of our children and seniors, are part of the fabric of Canada. Accordingly, December 18 is not simply a day for us to go about our normal business. It is a day for us to contemplate the year ahead, and determine how we as Canadians can take steps to reduce the suffering of migrant workers, while working towards a Canada that truly includes everyone.